So…I don’t want to boss you around, but guys? 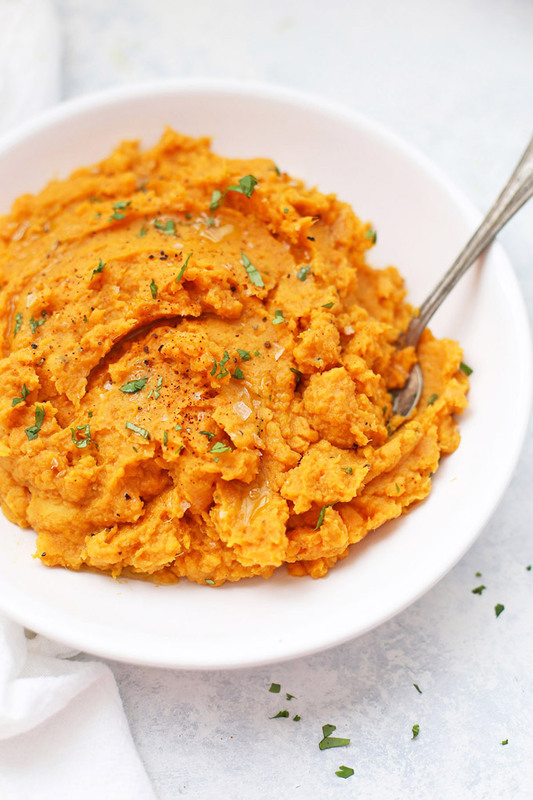 You should probably try these chipotle mashed sweet potatoes. They’re a DELICIOUS side dish that works for a ton of different occasions. Grilling up sausages, hot dogs, burgers, steak, or chicken? 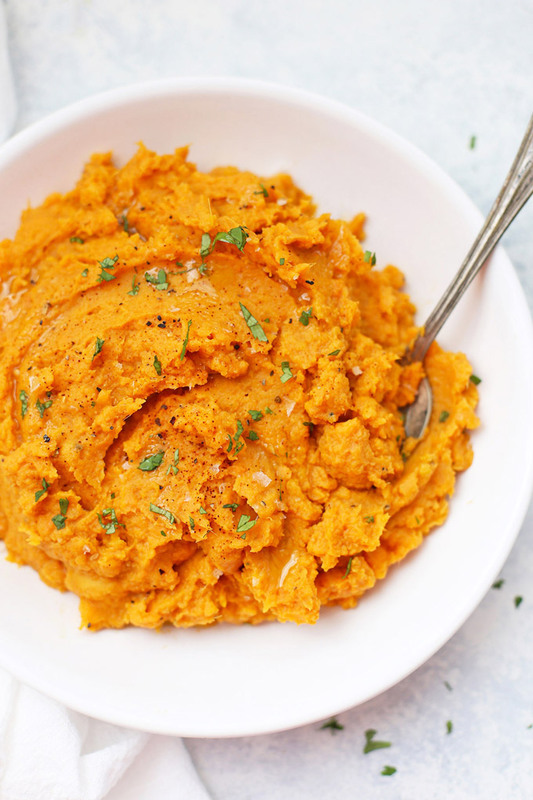 Serve them with these chipotle mashed sweet potatoes. 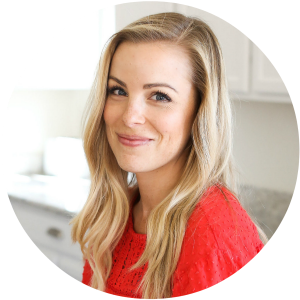 Need a quick side to go with a rotisserie chicken or something to make for meal prep? Bam. Looking for something a little different for to go with a Sunday roast or Thanksgiving dinner? 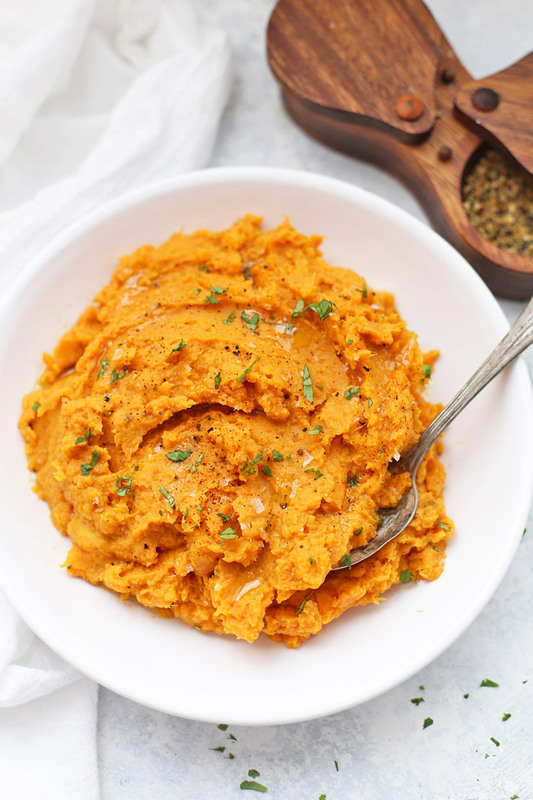 These chipotle mashed sweet potatoes are just begging to be made. To begin, I start with steamed or boiled sweet potatoes. I prefer steaming since a steamer basket (like this or this) is one of the best inexpensive additions you can make to a kitchen. I use a steamer for green veggies (like green beans or broccoli), for making the EASIEST-peel “boiled” eggs, and for sides like this one. After a quick steam/boil, the potatoes get a mash with chipotle chili powder (or chipotles in adobo), salt, pepper, and a little bit of ghee or butter and milk to make them creamy, dreamy, and delicious. 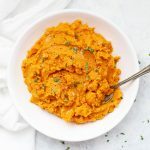 While I forever love sweet potatoes when their natural sweetness is highlighted (I’m looking at you Cinnamon-Rosemary Sweet Potato Wedges and Paleo Sweet Potato Casserole), they’re also absolutely mouthwatering when paired with something savory or smoky. They re-heat like a dream, which means they’re an awesome choice for meal prep, and they really do go with just about anything. So, I’m not going to tell you how to live your best life, but these chipotle mashed sweet potatoes are totally part of mine. Which Kind of Sweet Potato do you use? There are a LOT of different varieties of sweet potatoes. 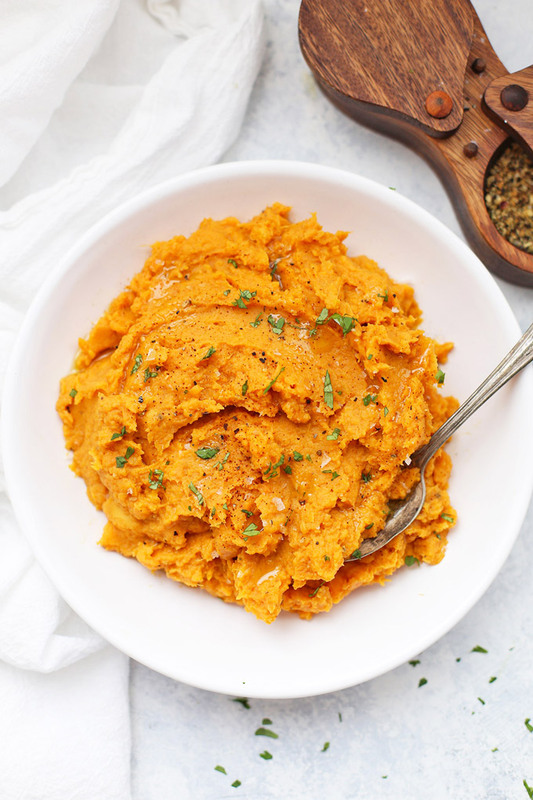 I recommend traditional orange sweet potatoes or garnet yams/sweet potatoes for this one. I’ve found they mash really well. The white and purple ones sometimes require a bit more work. Can I Make These Ahead? Yep! You can do that two ways. 1) You can prep them entirely, then reheat and stir in a tiny drizzle of milk/water or butter/ghee to get the consistency back. 2) You can pre-steam or pre-boil the diced potatoes and then refrigerate them. When you’re ready to mash, all you have to do is reheat the potatoes, mash, and proceed as directed. It would be a great way to free up time and space during Thanksgiving! Variations. I really REALLY love chipotle peppers packed in adobo sauce. It can be hard to find a good gluten free version (my favorite GF brand is La Costeña), and I haven’t ever found a paleo/grain free version in stores. If you’re not paleo/grain free, you can totally sub 1 chipotle pepper in adobo sauce. I’ve written directions in the notes section of the recipe card. Too spicy? These really aren’t all that spicy as written, but if you unintentionally get heavy handed with the chipotle chili powder (I’ve been there! ), you can tone the heat down with a drizzle of maple syrup. I always recommend starting at the low end (1/4 tsp) with the chipotle chili powder and working your way up as desired. To steam: Heat about 2 inches of water in a pot with a steamer basket inserted inside. Water should NOT touch the bottom of the steamer basket. Add the sweet potatoes and cover the pan to bring the water to a boil. Steam for about 20 minutes, or until sweet potatoes mash easily with a fork. To boil: place sweet potatoes in a pot and cover with water. Cover the pot and bring the water to a boil. Boil about 10-12 minutes, or until potatoes mash easily with a fork. Drain the water before transferring to a bowl for the next steps. Place cooked (and drained, if necessary) sweet potatoes in a large, deep bowl. Add ghee/butter/olive oil, salt and pepper, 1/4 tsp chipotle chili powder, and milk. Use a hand mixer, fork, or potato masher to mash the potatoes to your desired texture. (I like mine fairly smooth with just a bit of texture. Add more milk or butter/oil as needed. Taste and add additional salt, pepper, or chipotle chili powder to taste. Serve warm! Which Kind of Sweet Potato? There are a LOT of different varieties of sweet potatoes. I recommend traditional orange sweet potatoes or garnet yams/sweet potatoes for this one. I’ve found they mash really well. The white and purple ones sometimes require a bit more work. Variations. I really REALLY love chipotle peppers packed in adobo sauce. It can be hard to find a good gluten free version (my favorite GF brand is La Costeña), and I haven’t ever found a paleo/grain free version in stores. If you’re not paleo/grain free, you can totally sub 1 chipotle pepper in adobo sauce. Too spicy? If you unintentionally get heavy handed with the chipotle powder (I’ve been there! ), you can tone the heat down with a drizzle of maple syrup. There is a green herb in the picture – which one did you use?